I can’t believe it’s already been 9 years since I first became a mom. It seems just like yesterday, yet it also seems so long ago like a far distant memory. I wish I can go back to the day she was born- to see, hold and smell her again, yet another part of me remembers how painful this journey was and wish to move forward. Life is always this way, full of contradictions and mixed emotions. She started exhibiting developmental delays and began missing important milestones during her first year. As a young first time mom, I had no other baby to compare her to, which perhaps was a good thing. At her first birthday party, a little guest who was 2 months older waved good-bye and blew me a kiss before leaving the party. I didn’t tell anyone at the time but her tiny wave and kiss made my heart ache. 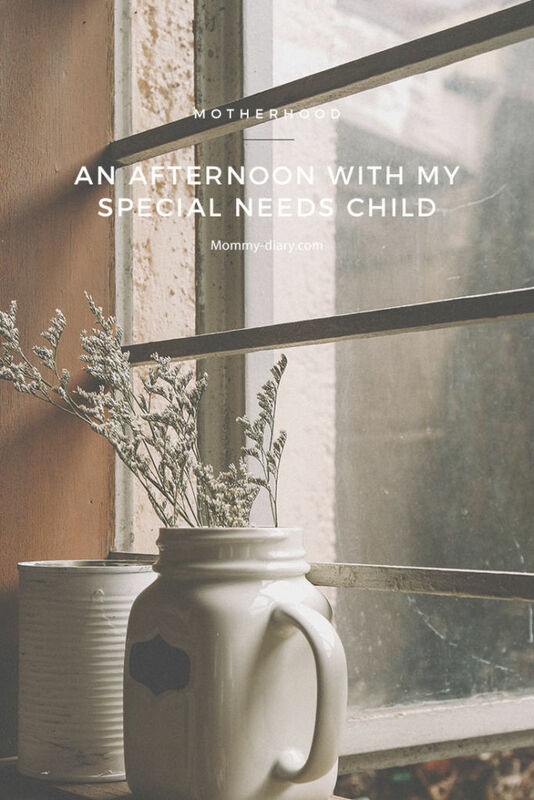 It was the beginning of a long, arduous journey as a mother of a special needs child. I was just starting to see all the joys of motherhood that other moms felt, the small joys that were missing from my life. I returned to graduate school that month. Yes a part of me wanted to work towards a career as age 25 was too young to stop trying, but another part of me wanted to run away from my worries and fears. At least this way I can keep myself busy and focus on things aside from maternal problems. Looking back, it is her who made my accomplishments possible. I remember the nights when I used to put her to sleep. I was pregnant with my second daughter, tired from pregnancy hormones, tired from my studies and tired of worrying about when she was going to start walking and talking. I was frustrated at the doctors who couldn’t give me a concrete answer, tired of all the reports and questionnaires that needed to be filled out with every new therapy and service, and heartbroken at my life as a 27-year old. As she is falling asleep, my mind would spin with so many thoughts, worries and fears as I look up at the dark ceiling wondering how I can make it out in one piece. It was a time of loss, mourning and deep soul searching. It was also a time of letting go of control and negotiating my ideals about perfection & motherhood. It was a time of desperate prayers, heart wrenching tears and silent maternal guilt. Her frequent speech therapy sessions, ABA services and tests still feel overwhelming at times. Nine years later, I now handle annual IEP meetings and test results without tears and I’m now well-versed at dealing with various providers; being respectful but proactive, making sure they know, with a smile, that I’m one of those moms who will fight for her child until the end. They tell me what a great, well-prepared mother I am. One therapist even remarks that if she had a child like Elly, she too, would prepare as I do. I put on a modest smile, and think but you have no idea how hard this is. I remember being teary eyed at her 3 year IEP and crying all the way home. I now sit through these intense 2 to 3 hour meetings with an air of maternal confidence and professionalism, thanking teachers and providers for their efforts but being equipped with the right questions to ask, concerns to address. How to prioritize. How to maintain a balance. How to be kind yet firm. Many years ago, I chose having a baby over law school. Ironically, I’m now her biggest advocate and can read legal and medical documents with ease– taking notes, highlighting, researching and constantly learning. Sometimes it still hurts to see other children take piano, art and swimming lessons while my child spends so much time learning things that come so naturally for others. Reading, writing her address, rehearsing appropriate two-way conversations. She is the hardest working nine-year old I know. She is now in her weekly ABA session with one of her favorite teachers. I can hear her laugh, ask questions and expand her mind. Her voice travels down the hallway into my heart creating soft and deep vibrations. Our Friday afternoon has looked this way for months now, but for the first time, I’m overwhelmed with a quiet calm of gratitude and joy. It has been less than a week since I decided to break free and begin to share my honest chronicles of motherhood. Already I feel so liberated, as if I finally answered to a call that was hovering over my head for a long time. You can read more about my special needs journey here. Hi Angela, I can totally relate to you in this post. My 13 year old son has special needs and he is my oldest (of 3) so I had no idea when he first started regressing because I didn’t have experience around young children. I remember those early IEP meetings very well and the stress and anxiety that went with them. Kudos to you for your maternal strength and professionalism – you are a true advocate for your daughter. In those early years, I always had my son on my mind constantly looking at different therapies and worried about his future. My life still does revolve around his therapy but, similar to you, I have found comfort through gratitude in the simple things. Hi Kat, thank you for sharing your story. As a mom with a special needs child, it’s always nice to meet other moms who understands what I went through and go through. I see you have a blog, can’t wait to visit and read your story. My daughter and I have come a long way, but it seems there’s always a new hurdle awaiting us. Wishing you and your son the best. So glad to connect.